In 2013, Country Garden (a property developer from China) launched 9,539 dwelling units (DU) in 45 apartment blocks on a 22 hectares (438 DU/ha) reclaimed a 2km stretch of Lido Beach in front of Straits View Hotel in 2010. It is a freehold plot in Danga Bay (Johor Bahur, Malaysia) for MYR $900million and has a plot ratio of 5.0 (MYR $376 per sq ft). The development is very dense, comprising of 434 dwelling units per hectare (100m x 100m). Units from 400 sq ft to 1,500 sq ft. According to a developer's representative that by 2015, 80% of Country Garden homes were sold of which 30% to Malaysian, 30% to Singaporean and 30% Mainland Chinese. Country Garden is involved in another massive project, Forest City (fully developed 2030 will have 200,000 dwelling units housing nearly 700,000 people), which involves reclaiming 1,300 hectares of land near 2nd Link (southwest of Johor near Tanjung Kupang and opposite Tuas). 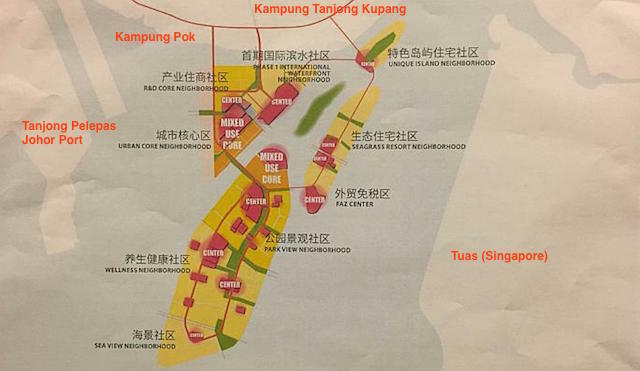 Another Mainland Chinese builder, R&F Properties, will be building about 25,000 dwelling units in Tanjung Puteri (on both sides of the Johor-Singapore Causeway) on 47 hectares reclaimed plot. It was reported that the developer paid the Sultan of Johor MYR $4,500million with a plot ratio of 7.0. As of 2010, Johor (Iskandar Malaysia) Region had 300,000 existing homes for about 1.5 million people. By 2020, there will be 450,000 residential units for 2.3 million people. Therefore the housing development is in tandem with population growth of 4.5% per year. Which is comparable to the total residential units in Klang Valley (Greater KL) stood at 1.8 million units for about 7.5 million people.